Switzerland is one great big picture postcard. From border to border, you’ll find gorgeous rugged mountain views punctuated with picturesque villages hugging valley floors. It’s a paradise for hikers in the summer and skiers in the winter. The best places to go Swiss are its small towns, which are gateways to this alpine paradise. But do spend time in these charming villages in Switzerland before taking off for parts unknown. If you’re headed for Gimmelwald, an off-the-beaten path destination in the Bernese Alps, leave your car behind. There are no roads to the village, so access is by foot or cable car. Gimmelwald is a sleepy farming community surrounded by fields of hay and majestic mountains. The village is so tiny, there’s no local school; students must travel to Lauterbrunnen. 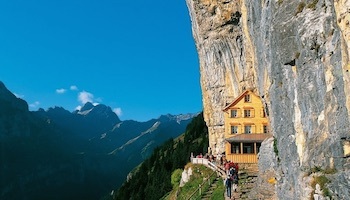 Gimmelwald houses are notable for stones called Schindles that sit atop the roofs to protect them from winter’s strong winds coming off Jungfrau Mountain. Andermatt is a village located in a valley where eight mountain passes converge in the Alps. It’s the largest of these passes, reminiscent of a bucolic jewel. Found at the center of the Gothard Massif, Andermatt is as picturesque as they come in Switzerland. You can travel around on a steam railway or in a five-horse drawn post coach or on your own two feet exploring this scenic spot. Andermatt is perhaps most famous for its winter skiing, with lifts running from the village to Gemsstock and Natschen. With 34,000 people, Sion may not be exactly a small town unless, of course, you consider the small-town charm it oozes. The capital of Valois, it is a gateway to smaller villages in the canton. Sion is known for its sun, mountains and castles. 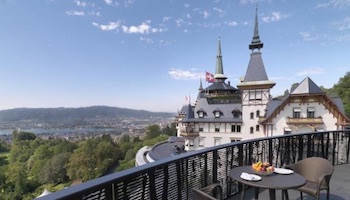 Two castles – the Castle of Valeria and Castle Tourbillon – sit on mountains overlooking one of Switzerland’s oldest cities. Sion has a quaint Old Town where you can sit at a café sipping Ferdant, a white wine grown here. Standing on the shores of Lake Thun, surrounded by vineyards and forests, is the town of Spiez. With a 12,000 population, Spiez is best known for its medieval castle with its 1,000-year-old Early Romanesque church. Except for the tall stone tower, the castle, which houses a museum today, might be mistaken for a huge white chalet. Many people combine a visit to the castle with a cruise on Lake Thun. After a day of hiking or fishing, end your day with a glass of Spiezer, the locally made wine. Soglio is another small Swiss village with awesome scenery. Wildflowers blossom on hills in the summer while snow-capped mountains fill the horizon. Overlooking this stunning scenery is Soglio’s chief landmark, the Church of San Lorenzo with its bell tower that stands above the village. Wander the narrow cobblestone streets to the Palazzo Solis, now a hotel, with its Mediterranean ambiance and giant sequoia trees. Bask in the solitude this tiny village begets, especially if you are hiking the Bergell trail or through the chestnut forest. Morcote is like other small towns in Switzerland: picturesque. But this tiny town of 771 takes it one step further. Located on the shores of Lake Lugano, Morcote was named the most beautiful town in Switzerland in 2016. The village is famous for its architecture, with an arcade dating back to the Middle Ages. You’ll also find houses from the 16th century and the 13th century church, Santa Maria del Sasso. Also worth visiting is the Botanical and Art Park with its displays of plants and artworks. Interlaken is the gateway to mountain villages in the Bernase Alps, but it’s worth a visit on its own merit. It’s been a tourist destination since the early 1800s when landscape artists, including Franz Konig, provided inspiration through their paintings. Back in those days, visitors came for the spa treatments and to breathe in the crisp mountain air. Interlaken is famous for its music festivals. Since it’s located on Lakes Thun and Brienz, you’ll want to take a relaxing paddleboat cruise on one (or both) of them. Wengen, in central Switzerland, may have only 1,300 permanent residents but you wouldn’t guess that from the crowds. The popular soars to 5,000 souls in the summer who come to hike 310 miles of trails and 10,000 people in the winter who come for the skiing. Wengen is a popular venue for ski races. This holiday resort has historic homes dating to the Belle Epoque era. As you travel by train to Wengen, be on the lookout for climbers attempting to go up the north face of Eiger mountain. 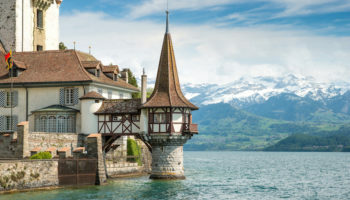 While visitors may come to Stein am Rhein to view the scenery – it’s on Lake Constance – many will come to view the village’s unique architecture. 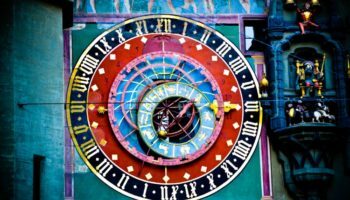 Half-timbered buildings in its well-preserved Old Town are enhanced with ornately decorated and colorful facades. Stein am Rhein was once a Roman fortress, but the village is filled with remarkable buildings that came afterward. 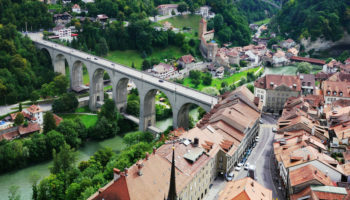 There’s an early church dedicated to St. John the Baptist, the monastery of St. Georgen and a museum that showcases Stein am Rhein life in the 19th century. If you’re a fan of James Bond, chances are good you’re familiar with the cable car and revolving restaurant on Schilthorn. 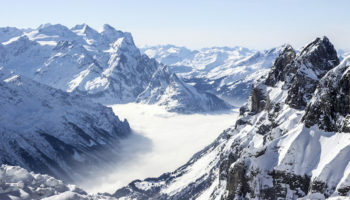 They were featured in On Her Majesty’s Secret Service that was filmed at Murren. Or if you loved Heidi books as a child, this traditional Alpine village will remind you of her home. 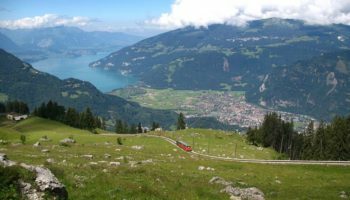 Wherever you look in Murren, you’ll see stunning views, from mighty mountains like Eiger and Jungfrau to flower-filled meadows. Grindelwald and Gilbert Grindelwald may bear the same name, but there the resemblance ends. Gilbert Grindelwald is a dark character in the Harry Potter series, while Grindelwald is a picturesque town in the Bernese Alps. 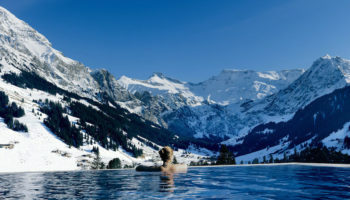 The scenery from here is fantastic and includes north face views of Eiger. Home to the largest ski resort in the Jungfrau region, Grindelwald has been a top tourist destination since the 18th century. 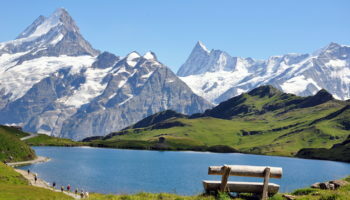 There’s plenty of good hiking in the summer, including the Eiger Trail. Guarda is another small Swiss town that is noted for its historic architecture, including 17th homes that have colorfully painted exteriors. It’s called a Schellenursli village after a character by that name in a children’s book. There’s even a path named Schellenursli that is suitable for families to hike together. If winter blahs get you down here, you can indulge in Guarda’s ancient tradition of using cow bells to chase winter away. You can find your way around Guarda with a special app that explains what the village is about. Waterfalls abound in Lauterbrunnen: This picturesque valley is home to 72 falls that cascade down the mountains. The most famous of these is Staubbach Falls, which drops nearly a thousand feet, making it one of Europe’s highest waterfalls. 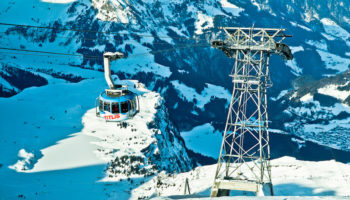 The town itself is a jumping off place for excursions into the Jungfrau region, including across the valley to Murren. This tiny picturesque village nestled among the mountains provided inspiration to many writers, including Goethe. Walking the valley is a must, though more adventurous souls may enjoy sky diving or paragliding. 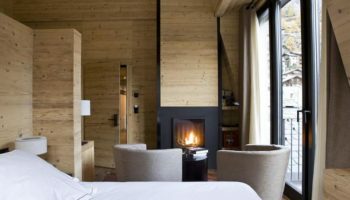 Zermatt is one of Switzerland’s famous ski and mountaineering resorts, which is easy to understand as it lies at the foot of one of the country’s highest mountains, the Matterhorn. 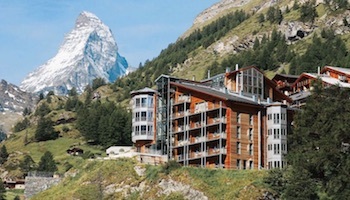 Zermatt is the place to go if you’re seeking glitz and glamour with your outdoors activities. Though it’s close to the border with Italy, Zermatt residents are more likely to speak German. You can hike or take a cable car into the mountains for spectacular views of the famed Matterhorn.